This image shows three views of the Archway. 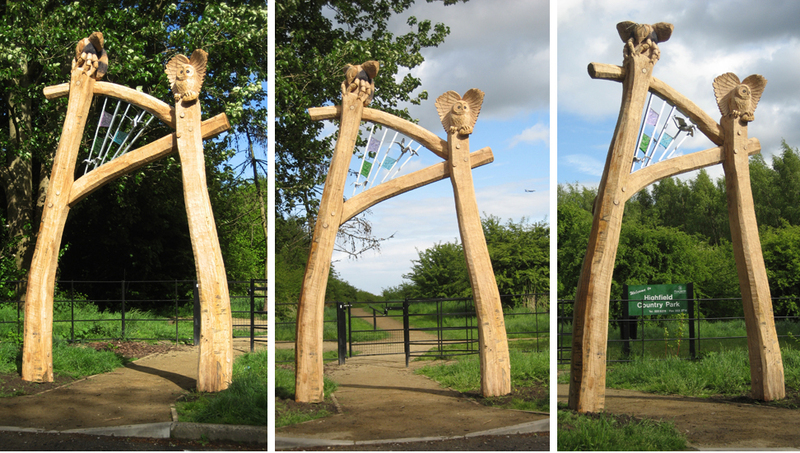 Constructed and carved Oak with a galvanised steel grill and flying creatures - a duck, bat and dragonfly. Inserted into the grille are three coloured cast glass panels, of butterflies and a dragonfly. The initial design featured a pig and metal bee at the top of each supporting post, but after further consultation the design was changed to a carved bee and an owl. Phil designed and made the arch, Diane made the relief panels - cast into glass by Jackson Fawkes. Installation by Phil and Damon Bramley who also transported the work to site.